As more Amazonian forests are felled, as more industry moves in, and as more aerial digital images are uploaded, evidence of previously unknown civilizations are being unearthed -- specifically along the border of Brazil and Bolivia. 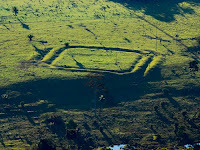 According to a recent article from New Scientist, researchers have discovered another "piece," perhaps, of what they term "garden cities," a network of villages located in north-central Brazil and dating from 1400 AD. The scope of the garden cities would have been the size of New Jersey, populated possibly by more than 50,000 people. That little "hard" evidence exists of them is due to the fact that they built with earth, rather than stone, leading the Amazon to reclaim its land once the society had been decimated by colonizers. The new discovery further supports the idea that the Amazon basin was heavily populated by "complex" societies before the European invasion, societies that were sedentary and long-lived. The structures that have been uncovered appear dissimilar to the geoglyphs of the Incas and the Nasca lines of Peru. "'I have no doubt that this is only scratching the surface,' says Alex Chepstow-Lusty of the French Institute for Andean Studies in Lima, Peru. 'The scale of pre-Columbian societies in Amazonia is only slowly coming to light and we are going to be amazed at the numbers of people who lived there, but also in a highly sustainable fashion. Sadly, the economic development and forest clearance that is revealing these pre-Columbian settlement patterns is also the threat to having enough time to properly understand them.'" Read the article at newscientist.com. This is really interesting. There have been reports coming out of the Amazon talking about a fairly high-density population living there at contact. Those people apparently were able to live in the Amazon and exploit it resources without irreversibly damaging the rainforest. It remains unclear if we can do the same. So much for the advancements of Western technology!